Another weekend, another show planned. This time poetry with musical accompaniment. The Headlands Center for the Arts is not far from the location of this week’s Wordless Wednesday photo. Maw Shein Win will be reading poetry with musical accompaniment by Amar Chaudhary for the Headlands Center for the Arts Spring Open House in Marin on Sunday, April 17. Under the title “Pitta of the Mind”, the duo will combine poetry with a mixture of electronic, ambient and pop-infused music. The Open House is from noon-5PM. The performance is 3:30-4PM. Arrive early to get good seats. Unlike a museum, gallery, or theater showing finished works of art, Headlands Center for the Arts supports the creative process. Come discover how a composer composes, what inspires a playwright, and how a painter decides when to put down her brush. Visit studios of more than 40 local and international artists working across artistic disciplines, explore our historic, renovated military buildings, and enjoy a homemade lunch in our Mess Hall Café. 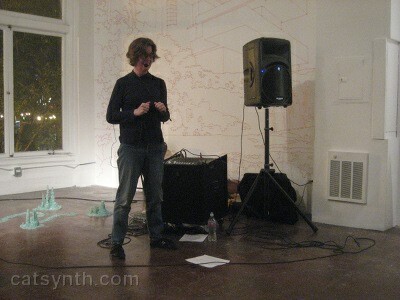 Last Thursday’s performances at the Luggage Store Gallery were all about poetry and spoken word. The first performance was a duo Polly Moller (vocals) and Moe! Staiano (percussion) interpreting a recent form of spoetry. Spoetry is spam that in its effort to evade filters rises to the level of high art. Our current set of songs in Reconnaissance Fly is based on spoetry, but the performance this evening featured a new and different form where words were grouped into disjoint sequences of two or three words, and in one case the words were themselves decomposed into individual sounds and reordered. 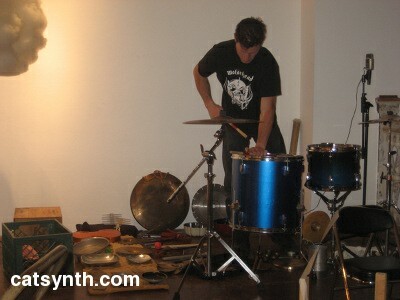 The performance began with coarse drums and cymbals set against dramatic recitation of the first spoem. Although I wasn’t fully aware of the structure of the spoem at the time, one could definitely sense that the words were quite disjoint from one another. There were multiple languages, which allowed Polly the opportunity to play with different accents, pitches and timbres within the text. The drums at times were “prepared” with various objects on the heads. At one point, the drums got very soft, then gave way to scraping sounds on the cymbals set against longer drawn-out words, and then both the voice and percussion suddenly became very staccato and active. The third piece focused more on Moe!’s percussive gadgets, including a back massager that was used to set a steady pulse for the piece, and set of old intercoms that were used to remotely set of loud squeaks from the edges of the room. This was the most rhythmic of the pieces, with a steady pulse that one could even sway to a bit. Moe! expertly threw and struck various objects in a way that kept the beat going, complete with accents. In the final piece, the sounds of the words were decomposed into even smaller units that further blurred any sense of meaning. I did recall the phrases “Isis kitsch”, however. The main percussion instruments in this piece were a set of rubber balls attached to sticks that created a powerful sound when rubbed along the walls or on the heads of the drums. The second set featured poet Robert Anbian with Rent Romus on saxophones and Bob Marsh on cello. This was more of a “traditional” poetry performance, with Anbian reciting long-form poetry against improvised music, and quite a contrast to Polly and Moe!’s more experimental set.